After unannounced outages since 2011 in early October, grid operators thanked residents in Texas' Rio Grande Valley region for their "understanding" in a statement. After an issue with a high-voltage line on October 8, the Electric Reliability Council of Texas, ERCOT, told electricity distribution companies to reduce system demand in the border region by 200 megawatts because of transmission issues and unplanned power plant outages of more than 1,000 megawatts. The rolling blackouts continued for two days. ERCOT operates the grid that covers the entire state of Texas. To cover part of the demand, ERCOT imported 50 megawatts from the Mexican grid across the border. Residents have been warned to get used to it. The border region that straddles the Texas and Mexico border includes four counties with a population of 1,305,000, of which more than 90 percent are Hispanic. Brownsville and McAllen are the largest cities in the border region. In a warning to consumers, Ken McIntyre, ERCOT vice president for Grid Planning and Operations, said border residents will see more "localized concerns" during the next few years. Two electric transmission projects will be completed in 2016, costing $1 billion in transmission improvements, which will help the border area import more electricity from norther parts of the Texas grid. But officials at ERCOT believe more work will be needed to keep-up with growing demand for electricity along Texas' border communities, which have few power plants and distribution lines. Growth along the border region in Texas is largely due to illegal immigration with the city of McAllen exploding in growth by 67 percent between 2001 and 2010. Current electricity demand along the border peaks at more than 2,300 megawatts and is expected to grow to 2,600 MW by next summer and then to 2,900 MW by 2020. 600 MW of current capacity is generated by wind. 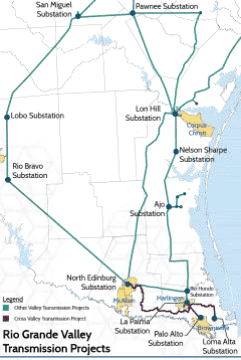 ERCOT representatives believe the entire border region will need 3,200 MW of additional generation but expect only a fraction of that will be built. As shortages increase, prices also increase but regulations limit how quickly power companies may increase those prices, thereby limiting how quickly companies produce more plants. Since around 2010, investors expected Texas to face severe energy shortages within the decade. Coal currently produces 45 percent of the state's electricity but state regulators believe EPA rules that reduce carbon dioxide emmissions by 30 percent by 2030 hinder development of new plants. Because of hydraulic fracturing, Texas is full of natural gas but gas power plants remain far more expensive to construct and maintain than coal plants. Larry Ewers is a natural resources expert based in Corpus Christi, Texas with a focus on Texas oil and gas investments and Mongolian mining projects.